Comes to sun himself and sing. With a fond, familiar mien. While the Song Sparrow nests in the extreme northern part of Illinois, it is known in the more southern portions only as a winter resident. This is somewhat remarkable, it is thought, since along the Atlantic coast it is one of the most abundant summer residents throughout Maryland and Virginia, in the same latitudes as southern Illinois, where it is a winter sojourner, abundant, but very retiring, inhabiting almost solely the bushy swamps in the bottom lands, and unknown as a song bird. This is regarded as a remarkable instance of variation in habits with locality, since in the Atlantic states it breeds abundantly, and is besides one of the most familiar of the native birds. The location of the Song Sparrow’s nest is variable; sometimes on the ground, or in a low bush, but usually in as secluded a place as its instinct of preservation enables it to find. A favorite spot is a deep shaded ravine through which a rivulet ripples, where the solitude is disturbed only by the notes of his song, made more sweet and clear by the prevailing silence. I fancy many of the little folks who are readers of Birds are among my acquaintances. Though I have never spoken to you, I have seen your eyes brighten when my limpid little song has been borne to you by a passing breeze which made known my presence. Once I saw a pale, worn face turn to look at me from a window, a smile of pleasure lighting it up. And I too was pleased to think that I had given some one a moment’s happiness. I have seen bird lovers (for we have lovers, and many of them) pause on the highway and listen to my pretty notes, which I know as well as any one have a cheerful and patient sound, and which all the world likes, for to be cheered and encouraged along the pathway of life is like a pleasant medicine to my weary and discouraged fellow citizens. For you must know I am a citizen, as my friend Dr. Coues calls me, and all my relatives. He and Mrs. Mabel Osgood Wright have written a book about us called “Citizen Bird,” and in it they have supported us in all our rights, which even you children are beginning to admit we have. You are kinder to us than you used to be. Some of you come quickly to our rescue from untaught and thoughtless boys who, we think, if they were made to know how sensitive we are to suffering and wrong, would turn to be our friends and protectors instead. One dear boy I remember well (and he is considered a hero by the Song Sparrows) saved a nest of our birdies from a cruel school boy robber. Why should not all strong boys become our champions? Many of them have great, honest, sympathetic hearts in their bosoms, and, if we can only enlist them in our favor, they can give us a peace and protection which for years we have been sighing. Yes, sighing, because our hearts, though little, are none the less susceptible to all the asperities—the terrible asperities of human nature. Papa will tell you what I mean: you would not understand bird language. Range—Eastern United States and British Provinces, west to the Plains, breeding chiefly north of 40°, except east of the Alleghenies. Nest—On the ground, or in low bushes, of grasses, weeds, and leaves, lined with fine grass stems, roots, and, in some cases, hair. Eggs—Four to seven; varying in color from greenish or pinkish white to light bluish green, spotted with dark reddish brown. Adult song sparrows have brown upperparts with dark streaks on the back and are white underneath with dark streaking and a dark brown spot in the middle of the breast. They have a brown cap and a long brown rounded tail. Their face is grey with a streak through the eye. 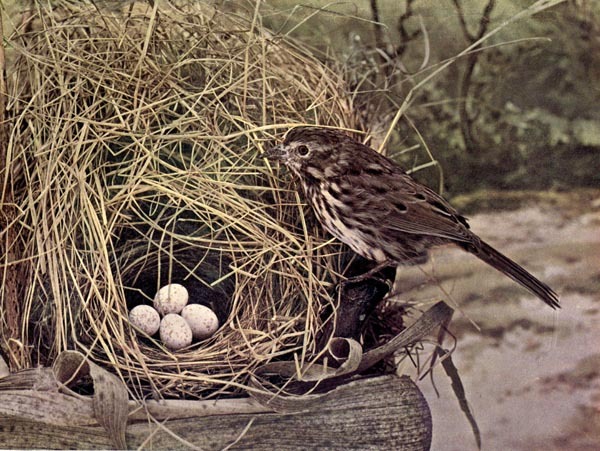 The Song Sparrow lays 3–5 eggs. The egg coloring is a brown spotted greenish-white. 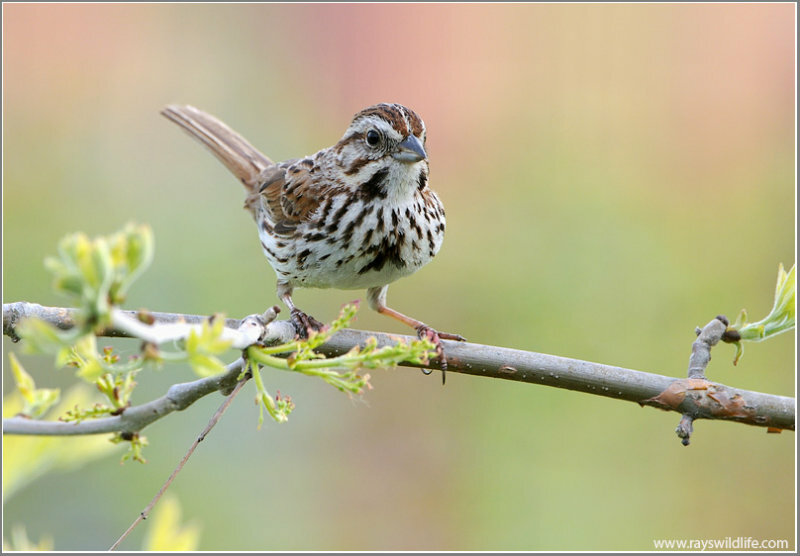 The Song Sparrow’s song consists of a combination of repeated notes, quickly passing isolated notes, and trills. The songs are very crisp, clear, and precise, making them easily distinguishable by human ears. A particular song is determined not only by pitch and rhythm but also by the timbre of the trills. 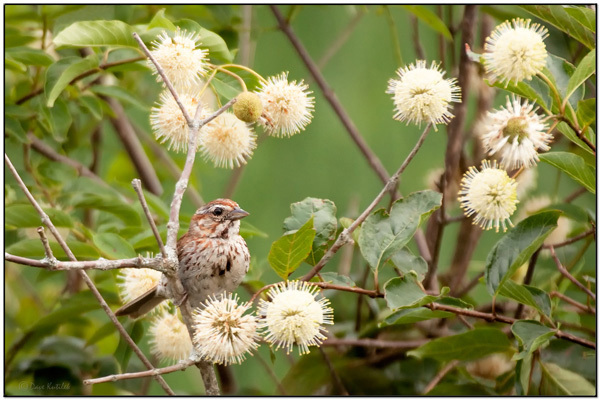 Although one bird will know many songs—as many as 20 different tunes with as many as 1000 improvised variations on the basic theme,—unlike thrushes, the Song Sparrow usually repeats the same song many times before switching to a different song. 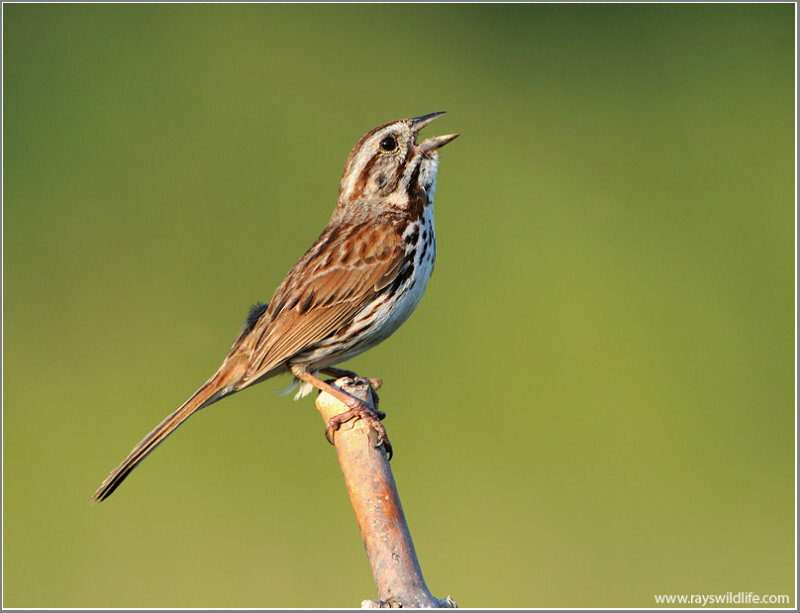 Song Sparrows typically learn their songs from a handful of other birds that have neighboring territories. They are most likely to learn songs that are shared in common between these neighbors.